Cancer is still a big problem. Currently it is the leading cause of death in the Netherlands and 1 out of 3 people is affected by it. Today is World Cancer Day, and therefore we pay special attention to the question: Why haven’t we defeated cancer yet? We are making tremendous progress, but cancer keeps surprising us. For example, we understand more and more about the complexity of the different forms of cancer. Every cancer is unique. However, where one patient with colon cancer responds well to a treatment, another patient does not. Why? To find the answers to these kinds of questions, we have to go back to the basics. At the Hubrecht Institute we do fundamental research to study these questions, partially supported by Oncode Institute. Oncode Institute is a virtual institute that consists of over 800 researchers from 12 different institutes, among which the Hubrecht Institute. By working together and sharing knowledge and expertise, cancer research will lead to results more quickly and these results will be translated to new therapies sooner. Today, the 4th of February, is World Cancer Day, and therefore we would like to pay special attention to cancer research. Geert Kops, group leader at the Hubrecht Institute and scientific director of Oncode Institute explains in the video below how the collaborations within Oncode Institute can contribute to better treatment for cancer in the future. 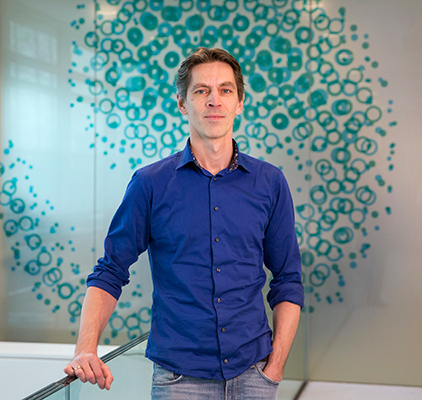 Geert Kops is group leader at the Hubrecht Institute, professor of Molecular Tumor Cell Biology at the University Medical Center Utrecht, Oncode Investigator and scientific director of Oncode Institute.